The aftermath of the Multi 21 team orders saga continues to rage, and today it has emerged that Red Bull have mandated that their errant world champion Sebastian Vettel will be ‘punished’ for his disobedience in Malaysia and demoted to the Toro Rosso team for the Chinese Grand Prix. Although Vettel apologised in person to the Red Bull back room staff at the team’s Milton Keynes head quarters last week, the team’s senior management – bar one – were in favour of additional disciplanary action as the authority of team principal Christian Horner was severely undermined by the Sepang incident. Apparently the catalyst for Horner’s reaction, was a caption photo of Vettel joking about the incident with Michael Schumacher, this prompted the team principal to act with greater resolve. Meanwhile the world champions have confirmed that Toro Rosso driver Daniel Ricciardo will be promoted to Vettel’s Red Bull RB9 seat for the race in Shanghai. Ricciardo will join fellow Australian Mark Webber in the team’s line-up, an all Aussie affair for the Chinese Grand Prix. Webber was unavailable for comment as he was surfing somewhere on the Great Barrier Reef to get away from the F1 sharks and spend some quality time with himself, as he contemplates being shafted yet again by his teammate. 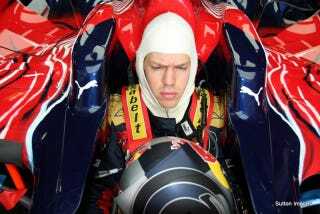 Reports from Faenza indicate that Vettel’s return to the team for a seat fitting ahead of the weekend in China was well received. The team members gave him a hearty welcome when he arrived at the factory, throwing him in the air in celebration, as is the local tradition in that part of Italy. Vettel drove in 25 grands prix for Toro Rosso winning his first Formula 1 race with the team when he powered to victory in the 2008 Italian GP at Monza. “Hopefully we kill two birds with one stone,” added the Red Bull team boss.